More Job Seekers Move for Work: Companies Compelled to Seek Out-of-Towners | Challenger, Gray & Christmas, Inc. The rise in relocation may be an indication that worsening labor shortages in certain regions are forcing employers to find out-of-town candidates, according to the firm. Over the first two quarters of 2016, an average of 11.3 percent of job seekers relocated for new positions. The relocation rate reached 12 percent in the second quarter, which was the highest percentage of job seekers relocating since the fourth quarter of 2014, when 15 percent of job seeker found employment in new towns. The 11.3 percent relocation rate in the first half of 2016 was up from an average of 10% recorded in the same period of 2015. The relocation rate rose to 10.8 percent in the second half of 2015, according to the Challenger data, which is based on a survey of approximately 1,000 job seekers successfully finding employment each quarter. “The number of metropolitan areas experiencing labor shortages is growing. As it does, employers in these areas will have to seek candidates from beyond the borders of the local talent pool. Job seekers who are willing to pull up stakes and relocate for new opportunities are finding welcoming arms,” said John A. Challenger, chief executive officer of Challenger, Gray & Christmas. The latest data from the U.S. Bureau of Labor Statistics show that there are 108 metropolitan areas with unemployment rates below 4.0 percent, including such major cities as San Francisco, Dallas, Denver, Boston, and Cleveland. “When the unemployment rate gets in the 3-percent to 4-percent range, it becomes extremely difficult to find any available workers, let alone ones with the particular experience and skill set required for unfilled job openings. So, employers have to caste a wider net,” said Challenger. However, simply seeking candidates from other cities and towns is not enough. Most people do not want to go through the hassle of relocating. Companies will have to offer a bigger carrot to entice candidates. A keyword search on Indeed.com reveals that there are currently more than 25,600 job postings on the site indicating “paid relocation” incentives. The 2016 Atlas Van Lines Corporate Relocation Survey found that 89 percent of employers offer some type of relocation reimbursement to new hires. More than one-third (36 percent) of respondents indicated that they provide full reimbursement for moving expenses, while another 38 percent said the offer partial reimbursement that varies based factors such as salary and position. 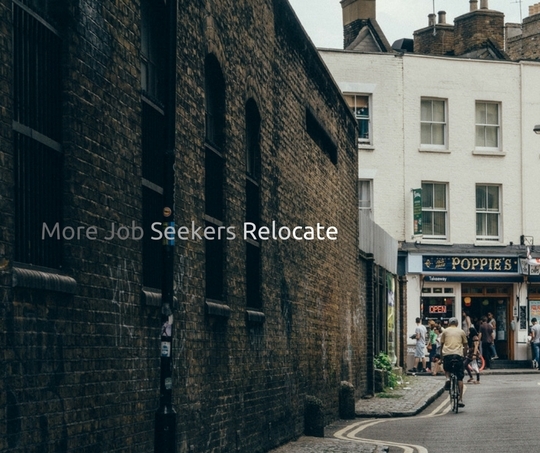 “Even with incentives, relocation is rarely the most desirable option for job seekers. There is a lot of risk involved and costs can often exceed what the new employer is willing to pay. This is why we typically never see relocation rates top 20 percent, even when business and economic conditions are at their best,” said Challenger.